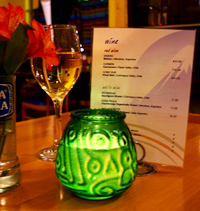 Chimborazo is a small restaurant with a big heart and a warm and welcoming atmosphere. At Chimborazo our desire is to introduce our guests to the traditional cuisines of Ecuador and the Andean highlands. We serve hearty dishes familiar to Ecuadorian family tables. Marcos Pinguil, the owner and chef of Chimborazo, came to Minneapolis from the Cañar sierra via the tropical coast where from a young age he learned to prepare dishes from Ecuador’s varied regions. In local indigenous lore, Chimborazo volcano represents Taita (Father), while neighboring Tungurahua volcano is seen as Mama. Otavaleño textiles and traditional Quichua music bring the spirit of the highlands to your dining experience.